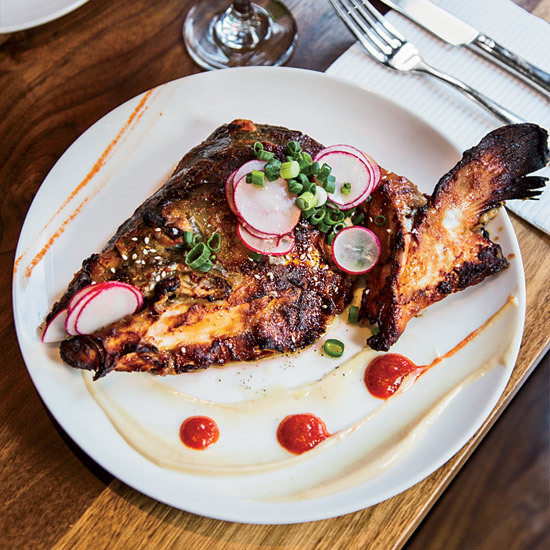 Where some chefs see trash, Mehdi Brunet-Benkritly saw a signature dish: a salmon fish head, marinated in miso, maple syrup and garlic. At the NYC spot Chez Sardine, the dish represents the restaurant’s guiding principle—a Japanese izakaya infused with a trippy, gonzo spirit. “We sell more than a dozen a night,” says Brunet-Benkritly, adding that most diners need some help figuring out where the best bits of meat are. Here, his guide to getting the most out of each head. For advanced eaters only. The eyeball resembles a soggy blob of fat—with a dark chewy pupil at the center. “It’s not my thing,” he says.